Birds are often hungry this time of year. 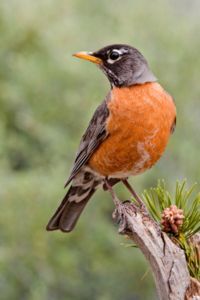 For many of us, the sight of birds eating what we have provided for them is deeply satisfying: their joyful feathers and flight give a lift to our own winter-weary hearts. 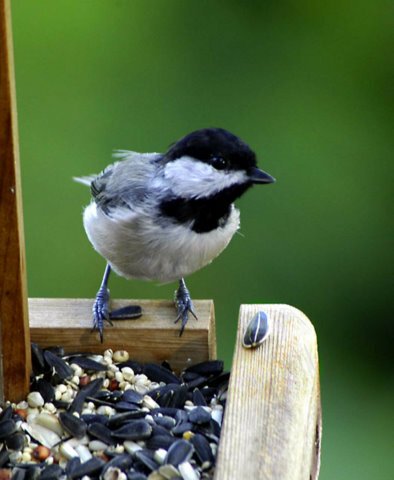 When we learn which foods are most appealing to different bird species we can give the birds already in our area a special treat, or we may attract more of a particular kind to our feeders. Either way, the birds will be happy! In this season of giving, we want to remember our backyard wildlife friends, too! neighbors happy throughout the holidays. Many of these ideas are a snap to make, and children love getting involved. When my son was little, he had a blast filling an orange rind with peanut butter and seeds and hanging it on a pine branch just outside our window. When he saw a chickadee actually pecking at it, he was thrilled! And it was the most exciting thing in the world to see a family of squirrels come right up onto our deck to eat the Native American corn he put out as a love-offering. Now, even though he is a teen (and we know how important being cool is to teens), he still has a warm fondness for squirrels and birds. 1. Cut festive shapes from cardboard, punch a hole in the top, spread shape with peanut butter, sprinkle with birdseed, and hang from a branch. Or frost with Bird Pudding (see below). 2. Ears of Native American corn left over from your Thanksgiving door decorations are a favorite food for squirrels. Hang an ear from a branch and place an ear on the ground nearby. Squirrels love a challenge, and it’s fun to see how cleverly they manage to get to the hanging food. If you really want to get fancy, try making little cabins from ears of corn mortared together with peanut butter and roofed with cardboard slathered with peanut butter and seeds or bird pudding. See how long it takes one enterprising squirrel to demolish the house! The birds will help to eat the leftovers. 3. After juicing oranges or grapefruit, fill the hollow shells with peanut butter and birdseed (or Bird Pudding) and place jewel-like cranberries around the rim. 4. Smear pinecones with peanut butter or Bird Pudding and roll in birdseed, then hang from a branch. citrus shell bowls. You may also smear this great stuff directly onto the branches of a tree. 6. Use your leftover holiday tree as a feeding station: Set it upright outdoors where it can be seen from your windows, and garland it with popcorn and cranberry strings. Forage for l local shrubs and plants that have edible seed-pods or berries and place a few sprigs in the ranches. Stale cookies and doughnuts may be hung like edible ornaments, and you can add any of the ideas above, too! You will create a sumptuous buffet for your wildlife and give your family hours of pleasure as they watch the animals enjoying their holiday gifts. By Cait Johnson, co-author of Celebrating the Great Mother (Inner Traditions, 1995).